Is there any more dog-loving town than Boulder, Colorado? Doubtful. Skip the stress of kenneling your fur baby and bring him or her along with you for a relaxing time in the foothills of the Rockies. Here are the top ways for you and your best buddy to explore Boulder together. 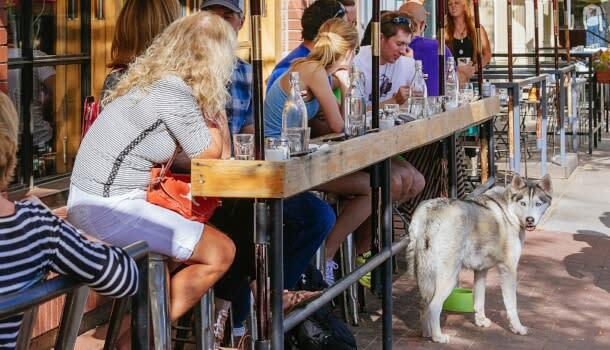 There are dozens of pet-friendly restaurant patios in Boulder. Here is a sampling to try. The Kitchen and Next Door (pictured above) – These two side-by-side sister restaurants offer true farm-to-table goodness and excellent people watching on Pearl Street. Rayback Collective – Fun, festive food truck park with a huge lawn with patio furniture and yard games. 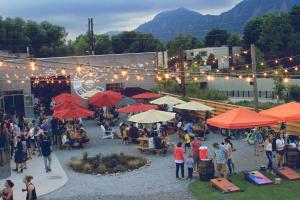 Sanitas Brewing – Craft beer and a patio with picnic-style tables and mountain views. Boulder Beer’s Pub on Wilderness – A separate doggy entrance welcomes your pup to Colorado’s first microbrewery in style. Audrey Jane’s Pizza Garage – Featured in Diners, Drive-ins and Dives, their outdoor patio is pooch perfect. Half Fast Subs on the Hill – Good ol’ fashioned hoagies and a chill vibe near the University of Colorado campus. 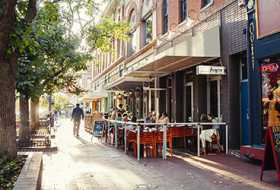 Brasserie Ten Ten – Delectable French cuisine on a charming, flowering patio right downtown. Foolish Craig’s – Brunch it up with Benji on the patio to enjoy sweet and savory crepes and hearty omelets. Avery Brewing (pictured below) – A big, sunny patio with gastropub fare and a huge variety of brewed-on-site beers on tap. Who let the dogs out? We did! Hiking with your hound is just an average day in Boulder, where miles and miles of hiking trails are open to dogs on leash. Boulder&apos;s color-coded dog regulation map tells you the exact rules for each trail in Boulder (if you&apos;re checking a specific trail or trailhead, just type in the name at the top to zoom into that trail). For a leisurely jaunt, head to Wonderland Lake Trailhead in North Boulder, where the glassy lake reflects stands of shimmering cottonwood trees and the Flatirons can be seen in the distance. 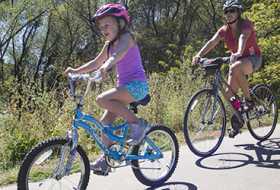 A network of pleasant trails can be accessed from South Mesa Trailhead. Cross the babbling South Boulder Creek and enjoy rolling Homestead Trail and then a gradual climb up Shadow Canyon Trail. Avoid Towhee Trail, which is closed to dogs. 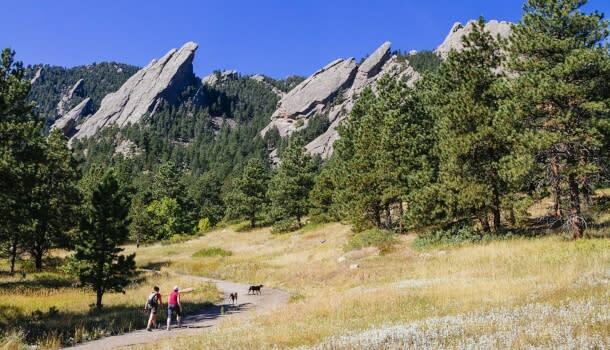 Chautauqua Trailhead is a popular choice for hikers with pups in tow. 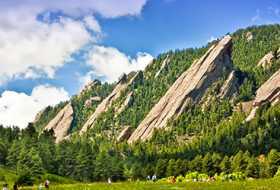 A variety of trails put you up close to the stunning Flatirons (pictured above). You can stop in the Ranger Cottage near the trailhead for trail suggestions, but reliable options include the Chautauqua and Bluebell Baird trails. Heading to Chautauqua to hike? On summer weekends and holidays, you can avoid parking hassles and ride the free Park-to-Park shuttle, and dogs are welcome aboard! Find all the details here. Does my dog have to hike on leash? Yes. All Boulder trails that allow dogs require you to have your dog on a leash. That being said, the City of Boulder’s Voice and Sight Tag Program does allow registered dogs to access designated trails off leash if they display special participation tags and are under “voice and sight control” of their guardians at all times. If you and your dog are visiting Boulder for a long period of time or come to town often, you may want to look into obtaining a Voice and Sight Tag; check out the program details here. Aw, c&apos;mon. You buddy&apos;s been such a patient traveler. It&apos;s time for a treat at one of these spots that caters to canines. Locally baked treats are on hand at pet boutiques Farfel’s Farm (right on Pearl Street) and PC’s Pantry (in the hip Steel Yards area). Ask for a Puppucino (a tiny cup of whipped cream) to go along with your human order at Starbucks. The PawBender (a cup of frozen custard topped with a milk bone and a drizzle of peanut butter) at Good Times Burgers is a fave with four-legged friends. Keep an eye out for Winne Lou, a canine food truck that doles out freshly whipped up treats and cute dog merch. Tons of Boulder shops are welcoming to dogs. You&apos;ll even notice that plenty of Pearl Street stores put water bowls out for pups to drink from. The following classic Boulder stops are on our radar as being especially dog friendly. McGuckin Hardware – This locals&apos; favorite hardware store has welcomed dogs inside for decades. You&apos;ll find everything you could ever want in this one store (really) and the staff in green vests are eager to help. University Bicycles has a soft spot for pups, which are welcome to browse alongside owners through a staggeringly large selection of bikes. Liberty Puzzles – Your pupper is invited to join you at this pet-friendly puzzle factory while you shop for amazing, artistic wood puzzles. Boulder Wine Merchant – Let a master sommelier point you to sip-able picks while your doggy gets some ear scratches. East Boulder Dog Park Expansive views and two huge ponds for swim time. Foothills Dog Park Plenty of space to run in a location that&apos;s a little off the beaten path. Valmont Dog Park A sandy space to tear it up adjacent to the watch-worthy Valmont Bike Park. Need to visit with family members who have allergies, or maybe you need to get some work done while you&apos;re in Boulder? Don&apos;t settle for ordinary dog sitting — send your beloved pup on a mountain adventure to get some fresh air, exercise and socialization. 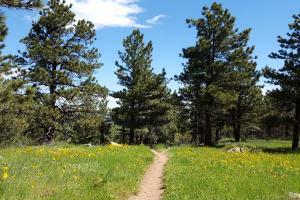 Boulder Doggie Adventures will take your dog on a hike for you! Just a friendly heads up about a few places best explored without your furry friend. Pearl Street Mall – Sorry, but no animals are allowed on Pearl Street between 11th and 15th Streets. This one’s enforced pretty regularly, so spare yourself the ticket. Boulder Reservoir – Dogs are prohibited through the gates or anywhere along the south shoreline of the reservoir between May 15 and Labor Day. During the off-season, when dogs are allowed, Boulder leash laws and pet waste removal requirements apply. Boulder Farmers’ Market – Market organizers ask that you do not bring your pets to the market for safety and sanitation reasons. See all available pet-friendly hotels here.